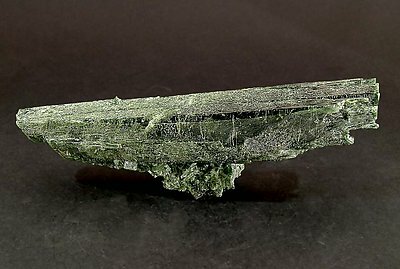 A doubly terminated (although the terminations are not that sharp) powerful Diopside chromium rich. Great color and luster, a floater and complete on all sides. Very esthetic specimen. 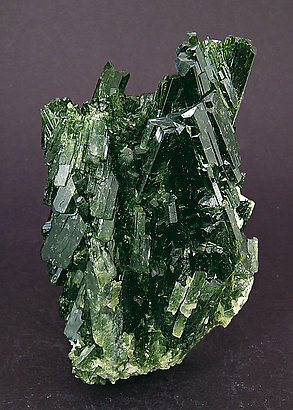 Crystals are very well defined, with an excellent brilliance, deep green color and a good transparency. On matrix. A very sharp Diopside crystal with very well defined faces and edges and a perfect termination, very rich in faces. It is bright, completely transparent, with a very intense and uniform color and has small Graphite inclusions. 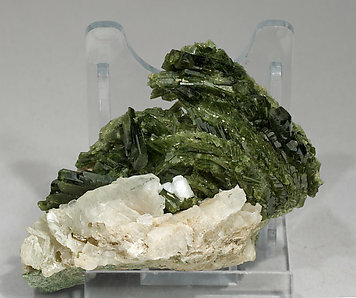 Doubly-terminated crystals of Diopside are not that common. In this case they occur in a large group of quite long subparallel crystals. The color, transparency and position on the matrix are also striking. 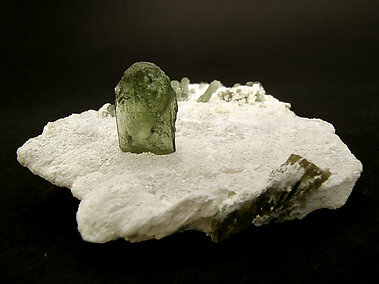 Very aerial group of flattened elongated crystals with very well defined faces and edges, transparent, bright and with a slightly bluish green color. The sample is from the Tiziano Bonisoli collection (number 6383) whose label we’ll send to the buyer. 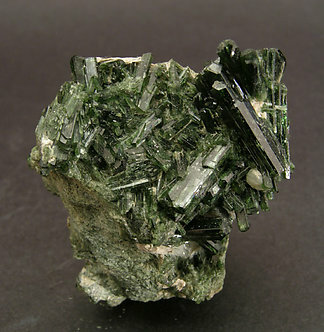 It seems to emerge from an old book of mineralogy, this classic group of prismatic crystals, some of them doubly-terminated, has a rich green color. It is on a green schist matrix. 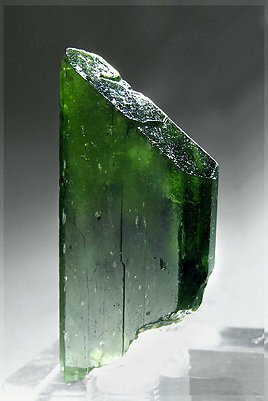 Very sharp crystal with neat faces and edges, translucent, and with a very deep and uniform green color. Surely one of the first (near 1980) Afghan diopsides to arrive in Europe. Excellent miniature. 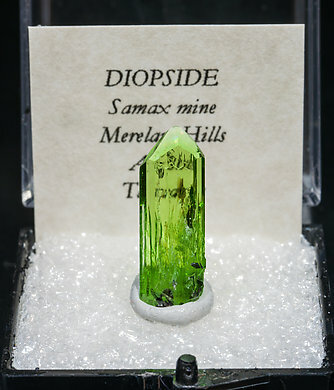 This Diopside crystal has very sharp faces and edges, also an excellent deep color and brilliance. The handwritten Folch label indicates that it was self-collected by Mr. Folch in 1980 and we can be sure that it was one of the first Diopside specimens from this locality to come to Europe. 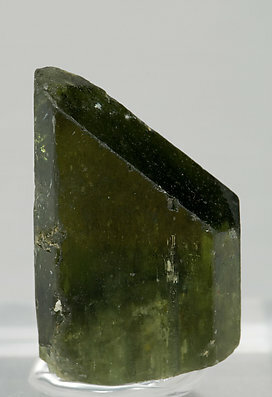 Probably this is one of the first Diopside crystals from Afghanistan to arrive in Europe, due to the fact that it was obtained at the locality by Alberto Folch in 1980, as the original label says. 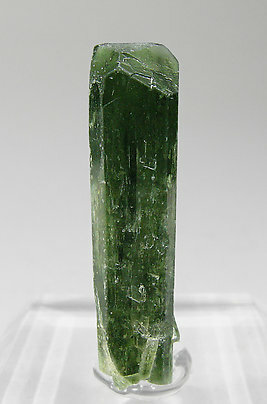 The single crystal has very well defined faces and edges, a very deep and uniform green color and it is rather transparent. Parallel growths, with a very pronounced curvature, of crystals showing very well defined faces and edges and perfect terminations. 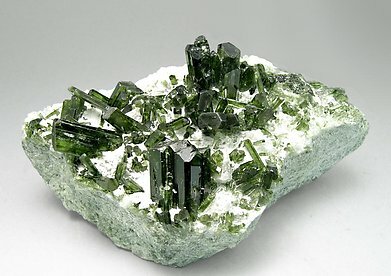 The crystals are translucent, very bright and have a very deep green color. 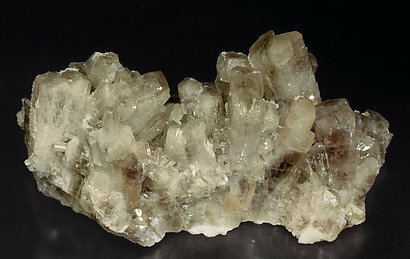 They are on matrix, with transparent Calcite and white small Albite . It is really a nice and special miniature. 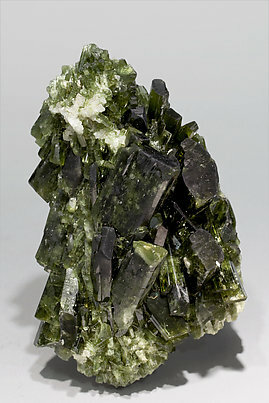 Group of light green prismatic Diopside crystals on a Calcite matrix and with Mica crystals. This sample was from Scott J. Williams of Scottsdale (Arizona). The piece is accompanied by the Williams label and card Nr. 5244 from the Folch Collection which we’ll send to the buyer. The main crystal is exceptionally aerial adding to its unusual prismatic habit, which is very much shorter than usual. 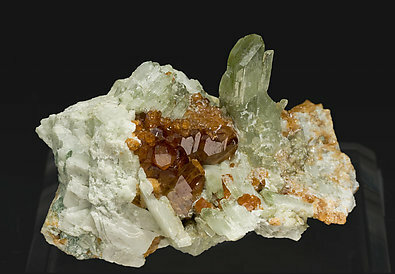 The base is formed of small purple crystals of Vesuvianite and prismatic completely transparent crystals of Diopside. 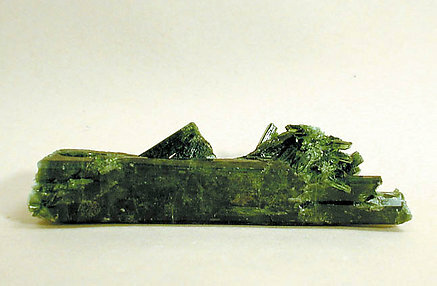 Group of Diopside crystals, one of them clearly dominant, of good size and color. 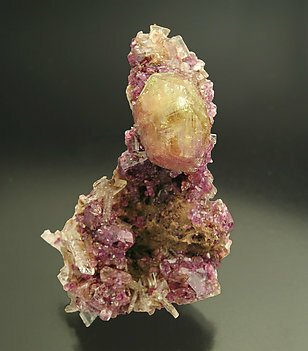 The contrast with the matrix, partially coated by nice Grossular crystals, increases its beauty. A great Italian classic. 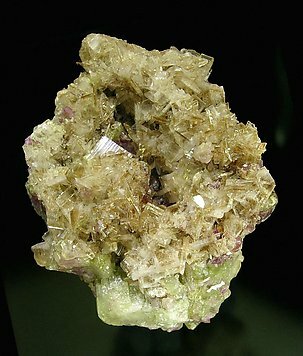 Aggregate of bright and very well defined crystals with perfect terminations and very well marked phantom growths, with deep shades of color easily visible on terminations, and a clearer color on prismatic faces. Aggregate on matrix of crystals with very well defined faces and edges and perfect terminations. They are translucent, very bright and have a deep and uniform green color. A novelty at Tucson 2010. 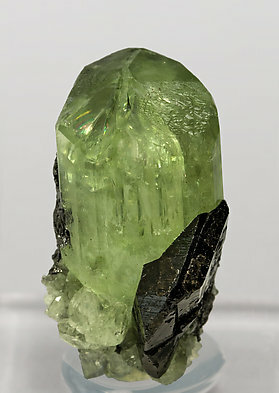 With the exceptional Tanzanite with Prehnite also appeared from Merelani some crystals of Diopside of notable size. This one has an excellent development of the upper terminal faces. It is transparent with an intense color and has an associated curious dark Titanite crystal that we analyzed. It also has small crystals of graphite on the back side. The sample has great quality. It is very esthetic because the Diopside crystals are more aerial and distinguishable than usual at this find. Perfectly defined, transparent and bright, they are placed on a base of prismatic crystals of Vesuvianite sharing yellow and violet colors. The sample, exceptional, is from a recent find in the now closed Jeffrey Quarry. The pocket, being big, produced very few specimens of such high quality. 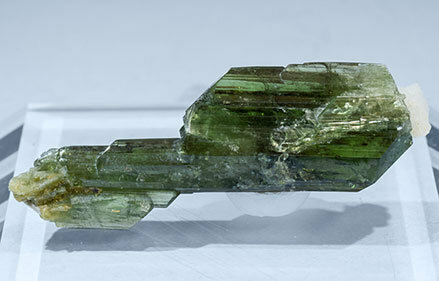 Diopside crystals have an uncommon habit: they are apparently tabular, but fine vertical striations and the presence of the pinacoid show they really are very flat prisms. The color and luster are excellent and the transparency extraordinary. 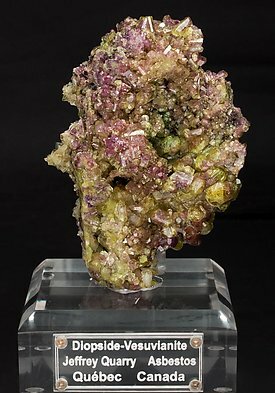 If all this seems not enough, their association with prismatic greenish-yellow and violet Vesuvianite crystals adds even more interest and visual appeal to the sample. The specimen is from a recent find by local searchers at the Jeffrey Quarry, now closed. Even considering that the cavity was very big very few pieces have such high quality. 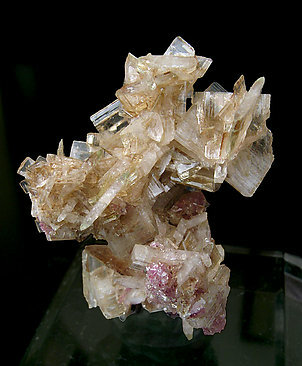 The tabular habit of the crystals is very uncommon, the fine vertical striations and the presence of the pinacoid demonstrate they are very flat prisms. Their color and brightness are excellent and the transparency exceptional. 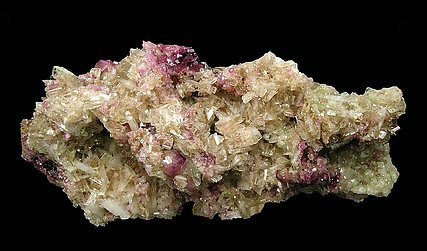 Even more, their association with minor violet Vesuvianite adds more interest and glamour to the sample. The specimen is from a recent find by local searchers at the Jeffrey Quarry, now closed. Even considering that the cavity was very big very few pieces have such high quality. 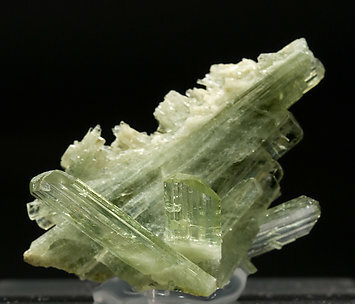 The tabular habit of the crystals is very uncommon, the fine vertical striations and the presence of the pinacoid demonstrate they are very flat prisms. Their color and brightness are excellent and the transparency exceptional. Even more, their association with good quality Vesuvianite of different color, green and violet adds more interest and glamour to the sample. A prismatic crystal, doubly terminated, transparent and of a good color. It crosses through a thin matrix of Quartz. Certainly original. 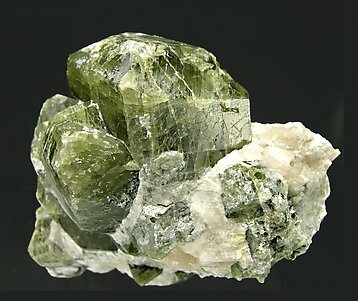 Parallel growth of very sharp and doubly terminated transparent Diopside crystals that are very bright with an intense green color and a small white Albite crystal attached.